SportRack Ridge Swing 4 Bike Rack SR2415 , Truck & Car Racks from Proline: Thule Racks, Yakima Ski Racks, Bike Racks Canoe and Kayak Racks Cargo Carriers and Truck accessories. 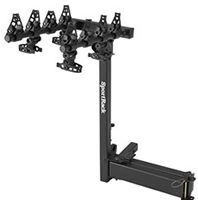 SporRack SR2415 bike Ridge Swing hitch receiver mounted bicycle racks. Swings away for easy access to rear of car.